Cassandra Frangos explains the distinctive skills and career strategies CEOs share, based on her new book. People who aspire to reach the C-suite — and perhaps to become CEO — must deliver strong results along the way, show leadership ability and have the emotional intelligence to embrace the softer side of the business, such as relationship-building and employee welfare. Those are among the attributes that make for successful CEOs, according to Cassandra Frangos, a consultant with executive search firm Spencer Stuart and author of Crack the C-Suite Code: How Successful Leaders Make It to the Top. Frangos is best known for her work at her previous employer Cisco, where as head of its global executive talent practice, she guided the transition in 2015 from the then-CEO John Chambers to current chairman and CEO Charles “Chuck” Robbins. As CEO, Frangos noted, Chambers wanted to make a larger impact on society, and also took a special interest in the lives of Cisco employees and their families, going out of his way to help those in need. To reach the top position, Robbins used the so-called “leapfrog path,” where he skipped over a few levels. That is one of four paths Frangos identified for people who reach the corner office. According to Frangos, finding support on the climb to the top is “more about collaboration and innovation, and not as much command and control.” She offered additional insights about successful C-Suite executives in a conversation with Wharton management professor Michael Useem, who is also director of the school’s Center for Leadership and Change Management. Michael Useem: Cassandra, does everybody want to make it to the top? Cassandra Frangos: I don’t think everybody wants to make it to the top. This is not a concept that would span every generation or every level in an organization. It’s specific to those that really set out a goal. As an example, one executive that I worked with at Cisco, [during] his interview when he was a young individual contributor at that point, said, “My dream is to be a CEO, and I’d love to be a CEO at Cisco.” So he knew right away exactly what he wanted to achieve. With others, it evolves over time. As they get closer to the top, they really want to make that contribution to the overall organization. Useem: As you move into the C-suite, and certainly when you move into the corner office as chief executive, you’re paid a good bit more. But by the time people reach middle or senior management levels, my observation is that pay as a draw is less important than the opportunity to shape events and drive a company in a different direction. What are your own observations on that? For quite some time, you were with Cisco, where you were responsible for its global executive talent. You played a key role in the transition from the long-serving CEO John Chambers, to the new person who came in. (In July 2015, Chuck Robbins replaced John Chambers as Cisco’s CEO, while Chambers became executive chairman and stayed in that role until December 2017.) Maybe drawing on the Cisco experience and your own observations with Spencer Stuart and beyond, what attracts somebody to seek that corner office, or at least the C-suite? He thought of everybody at Cisco as family, and he would request to have a list every day of any critical family health situations. So if you had a mother, a father, a child or somebody very close to you and your family who was critically ill or had some serious disease where they really needed some help, he would call the CEO of Stanford Medical or the CEO of Massachusetts General Hospital to say, “I have an employee. Their family needs help. I need to make a difference in their lives.” In other examples, [employees] are looking to make a broader impact on the company strategy and not just in their own division or their own functional area. Useem: Let me offer up what I often hear as advice for people who are rising through the middle ranks and are heading, maybe, for the C-suite. In aspiring to high office, often it’s a distant goal. It’s a treacherous path, and there are just a lot of factors of luck or bad luck along the way. You’ve got to be prepared for all of the above. Therefore I’ve often heard the statement, “Just do your job really well. Do it as well as you possibly can. Don’t look too far forward, and get what you’ve got to get done now, and that will help propel you in that longer direction.” But the more short-term calling is to do an extremely good job wherever you are. What do you think? But people who are aspiring to the C-suite do have their eye on the next two or three moves in their career. They know they would love to be [for example], a CFO. So they’re always thinking about, “Well, what’s the next experience I need to make sure that I’m preparing myself to be a great CFO?” Or a great CXO. It depends on the position they’re looking for, but also on gaining the right skills and experience [related to] where the future is going. For example, in marketing, some of the chief marketing officers that I spoke with about how they got to the C-suite talked about the trend of digital marketing where, if they didn’t learn that, they would have been displaced. Useem: Cassandra, the term “CXO” tends to be a generic phrase for all the people who are in the C-suite – chief marketing officer, chief information officer, chief financial officer, general counsel or the top legal officer, and of course the chief human resources officer, as well. As we look at what is now often termed the “C-suite,” give us a little bit of the geography of that territory. How many people are there? Do they have offices near each other? How do they work with the CEO? What’s up at that level? Frangos: It depends on the company, but generally speaking, the C-suite is the top team that reports to the CEO. A lot of times it depends on how the CEO wants to manage this. For example, when Cisco shifted from John Chambers to Chuck Robbins, Chuck wanted a flatter organizational structure. And he wanted the C-suite to be larger. That is becoming a bit of a trend in the C-suite, where a lot of CEOs are looking to have direct impact and direct relationships with the different levers of the business – such as marketing or product development or technology. So it has really shifted. Peter Cappelli, [Wharton management professor and director of the school’s Center for Human Resources] studied this where, let’s say, 15 or 20 years ago, it was six direct reports to the CEO. Now it’s about 12 to 13 direct reports to the CEO. That’s a lot to manage for a new CEO, because they’re trying to think through how they shape the strategy of the company, and how they’re moving the organization forward. But having actual direct access to the different functions also inspires, for example, the chief legal officer, along with the legal team, [compared to] where they were typically layered underneath, maybe a chief operating officer. The number of companies that have the position of chief operating officer is decreasing. That used to be [a role] that many executives aspired to. [According to one] study, only 30% of the S&P 500 companies have a chief operating officer. Useem: Help us understand why it’s a disappearing function or a disappearing title. Frangos: I think because of what many organizations are facing, they do need to have the direct levers on the business unit. The CEO doesn’t really want a layer in between him or herself and the business units or the different functions. Everybody configures the chief operating officer very differently, but they really are looking to have more of that direct relationship, direct access, and not a management layer in between. Some companies that still have the COO function sometimes use it as testing ground for succession. So if there are a couple of candidates that might be great for the CEO’s role in the future, chief operating officer is a natural position, where you could test out how this person performs with larger impact, and larger responsibilities. Useem: We often hear the phrase: “What got you here won’t get you there.” As you’ve looked at, worked with and sometimes even placed people in these very high positions, what do you think it takes in management style or leadership methods to go from that rung or two below C-suite into the C-suite? Frangos: It varies by company, but I’ve seen a few key themes. One is a more progressive leadership style, where it’s more about collaboration and innovation and not as much command and control. So many leaders who grew up in a command-and-control environment, or that was their leadership style, do have to leave that behind because organizations are definitely creating more dynamic organizational structures, with different ways of leading their teams. Many have virtual teams and dotted-line reporting structures, so it’s definitely becoming a lot more dynamic. The other [aspect is] emotional intelligence or being attuned to some of the complexities or psychology of people and the way that they are led, and the way that they can give their best to an organization. That is one [area] where I’ve often seen leaders derail, where they’re not thinking through the hard and the soft side of management. Another is you cannot have too big of an ego when you rise to the C-suite. 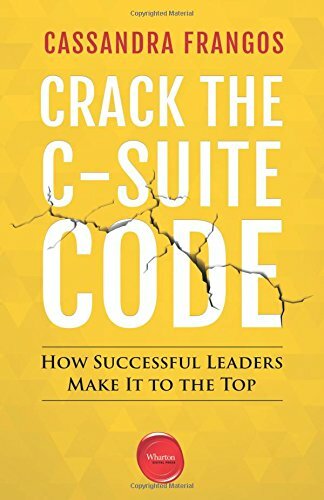 I’ve asked many of the executives I interviewed, “What took others off-track as you observed them inside your organization?” Many of them said, “Well, there was this person who was on the cusp of making the C-suite, but their ego was too big. And nobody could relate to them or nobody wanted to work with them because everything was about them.” So that is often a derailer for many executives. Useem: See if this resonates with what you hear when you interviewed people in that C-suite: It is essential to be able to think about the company or the organization as a whole. Say they have a particular responsibility, maybe manufacturing, or a particular product area or as chief of marketing. Once they enter the C-suite, it does call for them to think both of their function or their particular responsibility and the enterprise as a whole. Frangos: Many talked about that. It was an exciting shift for them, once they reached the C-suite, where they could put on the hat of the entire company, and their [specific] function was secondary. I always look at different executives who are presenting in an all-hands [meeting] or even if they are talking to somebody in the press. What I often admire is when you really can’t tell what function they’re from, and that’s a good sign of a successful C-suite executive. I remember seeing our chief human resource officer, and many said, “I’m not sure what position she’s in. Is she part of product development, because she can speak about engineering so well? Or is she in marketing, because she understands employment branding and the platform that digital marketing is bringing?” That’s the ultimate compliment, if they can’t tell what function you’re in. Useem: What advice would you have for a person who maybe is thinking this way? They are great at marketing, and they’ve come up through that arm. They’re on the verge of going into the C-suite where they do have to be conversant in earnings-per-share and accounting methods, and product manufacturing. In anticipation of that need to be savvy about just about everything, what tips would you have for an aspiring CEO-suite occupant? Frangos: Putting your ego aside and taking a step back and learning from others who have that functional expertise [is one piece of advice]. Spend a day in the life of the engineer or the sales leader or a professor, or whatever it might be for your industry. If their ego is too [big], they tend to not want to do that because it puts aside their expertise or their status. Yet, there are many times you can see executives doing that and [becoming] much more eloquent in the way they talk about the business. Useem: You make an interesting argument in your book that life is not linear. There is no one path to the top. You [identify] four “core paths” to the C-suite – the “tenured executive,” the “free agent,” the “leapfrog leader,” and the “founder.” Help us appreciate those four paths – how they differ, and what you’d recommend for a person aspiring to get somewhere up the ladder one day. Frangos: These paths are common across industries and across functions. The tenured path is a straight-forward one, where you’ve grown up inside a company. You’ve had a long tenure at the company, and you’ve moved up by different positions. It could be that you’ve zigzagged through different functions to get to a position, but really your whole career has been built by that company. That’s an example where you have to love the company. So if you are thinking of staying with your company and being that tenured executive that reaches the top, just know that it requires some patience. Many executives I talked to who are on the tenured path said there were definitely moments where they thought about leaving and said, “I’m never going to make it to the top here.” [But] they were persistent in making sure that their goals were met. Many said they were part of the same company, but the company had evolved so much over time that they felt they were part of three or four different companies. So you do have to love it, if you’re on that path. At Spencer Stuart, we spend a lot of time helping executives do that, because they are vulnerable. They are thinking about the next career move. Many were in middle management and became top of the house in a smaller organization. We see that a lot – larger company to smaller company. They end up very happy where they are directing the company strategy. They’ve challenged themselves to learn a new culture, a new environment, but it’s certainly riskier than the tenured path. The third one is the founder’s [path] – entrepreneurs who were in larger companies and for whatever reason, they just had this passion to start their own company. For example, Amy Chang was almost to the top at Google, and she had this idea that she was so passionate about. So she left Google and started a company [called Accompany] that is cutting-edge in terms of helping executives prepare for information and technology use. It can be tricky, but that’s an unmet need that she wanted to fill in the industry. Other founders talked about [how it is] a risky path. You need to have some security or some financial backing if you’re willing to do it, because it’s going to be somewhat of a slow financial gain as you’re trying to get your idea proven. But that’s one where it can pay off wildly or not be successful. So you have to be okay with failure, as well, on that path. The leapfrog path is becoming a bit of a trend. BCG (Boston Consulting Group) did a study of this when Cisco went through its CEO succession. This is a path where Chuck Robbins skipped a couple of levels to reach the CEO’s job. You don’t have a lot of control over it because it’s not that you can set out to say, “I’m going to skip over my boss. I’m going to take a few steps in level.” But what you can control is eagerness to learn different parts of the business, or also just show a lot of potential. We measured the potential of the candidates for CEO and saw that Chuck Robbins had a lot of potential. We could see him in the top job. It’s a lot of relationship building, where you need to make sure that you’ve got great relationships with the board, which he did. The other part is, if you are going to leapfrog over someone or a few levels, the followership has to be there. You want a whole organization to be behind you if you are going to be the leapfrog leader, because you need to have the support of employees or executives or customers to say, “Oh, absolutely, I can see this person in this job.” If you did skip a couple of levels or one level, and you didn’t have a lot of followership, you’ve got a much tougher job ahead of you. Useem: What are your thoughts on the kind of leadership or learning in the C-suite that’s required to then have a shot at becoming the chief executive officer? Frangos: It’s being willing to reinvent yourself and being willing to reinvent the company. It is about making sure that you are honoring some legacy and honoring some culture attributes or ways that the company works with customers. But you’re also willing to reinvent, because one answer isn’t the right answer for the next 10 years for a company. That takes a fair amount of risk. The other is just endurance. It’s an incredibly difficult job, so having the resilience and endurance to do the kind of high-pressure job that many CEOs have is very important. And then, as I mentioned earlier, [you must have] a real appreciation and understanding of the hard side of business and the softer side of business. Useem: What advice would you have for somebody who may not crack the C-suite, but would like some success in a personal sense, and also make a difference in the company that they are rising up in? Frangos: It’s always continuing to make a difference in whatever role you’re in. Just be sure you’re [getting] results, making an impact in whatever job you are in, but also creating relationships across the organization. It’s not just okay anymore to have a great relationship with your boss. You need to have great relationships with people who are above you in the organization, your peers, and if you have people who work for you, that would [also] be an important relationship. Many executives who rise up found ways to embrace 360-degree relationships across the company. Discover how you can formulate a global strategy for your organization and learn how to execute it with speed and agility. Explore ways of serving customers and leading across borders. Expand your organization’s visionary capacity to inspire greater possibilities for your collective future. Learn more.